When the owners of the Dallas Cowboys began conversations in the 1990s around building a new stadium, they wanted to incorporate decades-old plans to give the indoor stadium the feeling of an outdoor venue. Their wish list included a retractable roof and glass doors at the end of each end zone, along with advanced features such as a high-definition video display board, luxury suites, and more. Ground broke for the new stadium at the end of 2005, and project architect HKS, Inc. called upon Oldcastle BuildingEnvelope®, A CRH Company, to supply technical expertise and custom engineering of what would be the largest retractable glass doors in the world. Located at each end of the stadium, each door stands at 180-feet-wide by 120-feet-high and takes 18 minutes to open or close. Additionally, Oldcastle BuildingEnvelope custom-engineered the unitized curtain walls on the “bowl” portion of the stadium. The curtain walls needed to be factory-assembled, sealed, and glazed, and designed to project 14 degrees, creating the visual effect of an actual bowl. “When you are designing the largest and most advanced NFL venue ever built, you need to work with trusted partners. 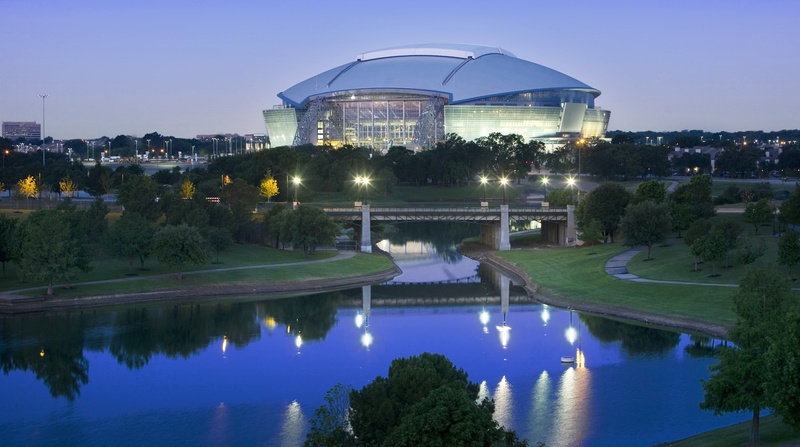 Oldcastle BuildingEnvelope played a critical role in custom-engineering a complex curtain wall system and unprecedented glass end zone doors for Cowboys Stadium." — Mark Williams of HKS, Inc. The 3.1 million square foot, 150 acre football stadium seats 100,000 fans, features 380 suites, 15,000 club seats, and sponsored entertainment end zones. It has received several design awards – including the Sports Facility of the Year and the Build Texas Award. In addition to the custom-engineering and technical support provided during the project design, CRH companies provided dozens of products that were used for the sitework, building envelope, interior, and exterior of the stadium. While CRH businesses supplied many products for the stadium, we hadn’t yet scratched the surface on coming together to offer a fully-integrated approach through early supplier involvement. With many lessons learned, the Cowboys’ Stadium project served as the genesis for early collaboration on other large-scale projects, including the Mercedes-Benz Stadium in Atlanta. See how you can benefit from having a materials supplier involved early in the design of your next project. Sign up now and don't miss out on any innovative Building Solutions content. © 2019 CRH Americas, Inc.